Fire destroys a large multi-million dollar estate in Pawling. 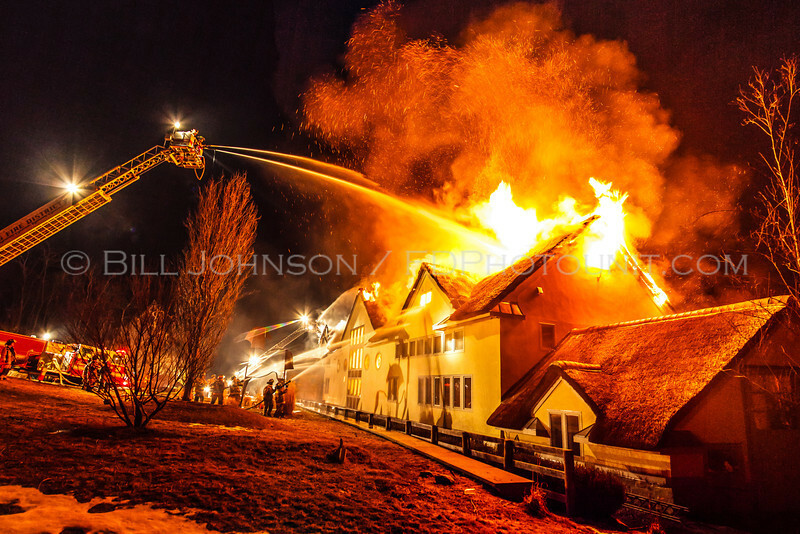 Photo's of a structure fire that occurred on March 7, 2009 in Pawling N.Y. The structure was a 9000 sq. ft. 2 1/2 story mansion that was built out of a former barn. The structure which was ~ 200 ft. wide by 50 ft. deep was equipped with a residential fire sprinkler system that was operational at the time of the fire. The structure had a thatched roof (As in hay) which ultimately led to the destruction of the building when an apparent chimney fire spread to the same. Firefighters attempted to use roof saws to vent the roof and cut around the fire but were unable to do so when the hay became jammed in their saw blades making them inoperable. Once the fire burned underneath the thatched roof and above the residential fire sprinkler system, it began to take control of the building and eventually destroying same. The house reportedly contained millions of dollars of uninsured art work that was lost in the blaze. The structure also contained three expensive autos in the garage in the lower level which were saved after an excavator that the structures owner had stored on site was placed into service to make a trench cut in the roof.... This trench cut was successful in stopping the fires progression but unfortunately most of the structure was already lost.. Over thirty pieces of apparatus from 12-plus departments from N.Y. and Connecticut battled the blaze.